From the West (Rochester): Take the New York State Thruway heading toward Albany to Exit 41 (Waterloo). At the exit, turn right onto 414 South for a short distance. At the first traffic light, turn left onto Route 318. Take Route 318 until you reach the T in the road, which is Routes 5 & 20. Turn left onto Routes 5 & 20 going east which will then take you approximately 11 miles directly into Downtown Auburn. From the East (Syracuse): Take Route 690 West from Syracuse. Stay to the right and pick up Route 695- look for the Auburn signs. At the end of Route 695, stay to the right and merge onto Route 5 heading west toward Elbridge. Go straight through Elbridge on Route 5, which takes you directly into Auburn where Route 5 is also known as Grant Avenue and then becomes the Arterial. This leads into Downtown Auburn. From the South (Ithaca): Take Route 34 North straight through to Auburn which will place you directly into the heart of Historic Downtown Auburn. Route 34 is also South and North Streets which intersect Genesee Street and Route 20. From the North (Watertown): Take Route 81 South to the New York State Thruway. Follow the Thruway signs toward Buffalo. Get off at exit 40 (Weedsport). At exit turn right onto Route 34 over bridge, straight through Weedsport. Route 34 leads directly into the heart of Historic Downtown Auburn. Route 34 is also South and North Streets and intersect Genesee Street and Route 20. For on-street metered & kiosk parking there is a $0.25 minimum for 20 minutes, and one hour is $1.00. Insert coins into the meter adjacent to your spot, or pay at a nearby green parking kiosk. You can also use Pango Parking with your cell or smart phone. On-street metered & kiosk spaces have a 2-hour limit. If you remain parked in the same spot longer; you risk receiving a ticket, regardless if you pay more money. If you plan to spend 2+ hours Downtown, please park in long-term spaces. Please note, except for handicapped spaces, on-street spaces on Genesee Street and State Street don’t have meters. You must pay a parking kiosk to park there. Parking kiosks are on Genesee Street between William Street (Visitor Information Center) and Loop Road (Wegmans), and on State Street. They are also in the lower level of the City Parking Garage, and in the Dill Street lot. Kiosks are dark green with a blue “P” on the side. Meter attendants are on duty and enforce parking Monday – Saturday 9AM – 5PM. For further questions contact staff at Auburn Downtown BID 315.252-7874, or visit them at 128 Genesee Street, or CLICK HERE. Deposit coins to cover the desired amount of time ($0.25 minimum). Press the big green button to print your receipt. Retrieve receipt from the lower slot behind the plastic shield. The receipt indicates the time when your parking term expires. Place the receipt inside on the driver’s side dashboard face-up so it’s clearly visible. Please note you can pay at any kiosk to park anywhere. The kiosks in the Dill Street lot make it easy to drive up & pay. You can use those receipts to park in any on-street space, including metered spots. If there’s time left on your receipt, you can move to another location until your time expires. 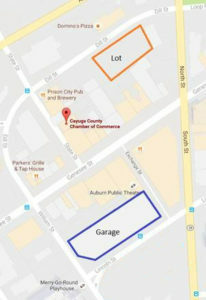 The City Garage, on Loop Road, offers convenient covered parking in the center of downtown, adjacent to Auburn Public Theater. An elevator runs until 11PM. Parking is FREE for the first two hours. Pay to park until 7PM weekdays, parking is FREE on weekends. For hourly rates & permits, please call the City Treasurer’s Office (315) 255-4143. Dill Street parking lot is behind Lattimore Hall, and to the right. The lot is serviced by a drive-up kiosk, with a maximum time limit of 8 hours. Sign up for Pango Parking on your smart or cell phone, and pay & manage your parking session remotely. The smart phone app is free, and calling from a cell phone is toll free. If you have a cell phone, you can call toll-free 1-877.697-2646 to follow instructions, or press *0 to speak with a representative. If you have Internet access, go to https://www.mypango.com and click “Download Pango” at the top of the screen. Once you have downloaded the app and entered your information, an email will be sent to your account with further instructions. You will need to provide your mobile phone number, license plate and the credit or debit card number to which you are linking the account. Save this number in your cellphone, and call, toll-free, 1-855.547-2646. Call it when you park, and you’ll be prompted to say Streets & Open Lots, then Auburn, NY. If you have a smart phone, once set up, open the app and select Streets & Open Lots. Then select Auburn, NY. For cell & smart phones, for on-street parking that is metered or has kiosks, select 65801. For parking sessions in City-owned lots,select 65802, and for the metered lower level of the City Parking Garage, select 65803. You can then start and end your parking sessions from your phone. Please note you still must abide by the City’s 2-hour parking limit. Pango will shut off your session after you’ve maxed out your time.